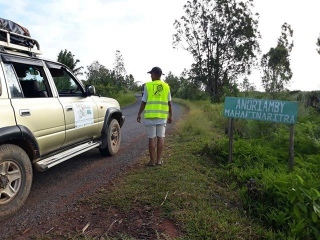 As part of a new natural Disaster Risk Reduction project launched in partnership with the French NGO Pompiers Humanitaires Français (PHF) and the local OpenStreetMap community, Missing Maps’ member CartONG implemented a 4-week mission in Madagascar in March 2018. The objectives: raising awareness on data sharing, collecting data in the field and producing maps! For several years, CartONG has developed and maintained friendly relations with Madagascar. Our Missing Maps coordinator, Violaine Doutreleau, a then-volunteer, had organized a training in the island back in July 2015 which helped launch and structure the Malagasy OpenStreetMap community. This first training was then followed by 2 other deployments in 2016 and 2017: the first one linked to the project of Madagascar Solidarity Atlas and the second one developed to provide webmapping support to CNLS. 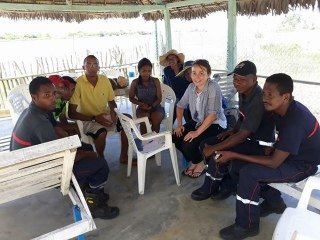 In 2017, we started a new project in partnership with the NGO Pompiers Humanitaires Français (PHF) – French Humanitarian Firefighters, which has been operating in eastern Madagascar (Atsinanana region) since 2010. In particular, PHF initiated the creation of an emergency and civil protection centre in Vatomandry in 2013. Malagasy volunteer firefighters currently work on prevention (tree cutting, etc. ), awareness-raising (first aid exercises and trainings, etc. ), and assistance and reconstruction in the district’s capital. They are regularly called to intervene on the whole district but have not had so far the capacity to deploy in rural areas, for lack of being able to plan their interventions outside of urban areas despite having the equipment to do so (SUV). The goal of this new project was thus to improve the firefighters’ ability to respond by providing them with maps which would allow them to define their intervention areas and to deploy more easily when needed. To this end, we organized several Missing Maps mapathons between October 2017 and February 2018 in order to prepare for the OSM base map needed for the mission. As a result, a total of 60 000 buildings and 3000 kilometers of roads and pathways were either added or updated on OSM – all data were then validated by CartONG volunteers. We would like to take this opportunity to thank Airbus for providing us with the necessary satellite imagery for the mapathons. This preparatory phase led to a mission in Madagascar organized from March 3rd to 27th 2018, thanks to the decisive support of the CNES (the French Space Agency). 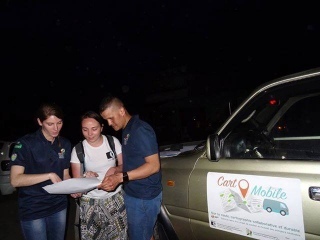 After a preliminary phase in Antananarivo with the Malagasy OSM community – during which a data sharing workshop, similar to the one organized in January 2018 in the DRC, was organized – the combined CartONG & OSM-Mg team then left for the Atsinanana region to collect data in the field for 3 weeks. The mission was disrupted by the passage of the tropical storm Eliakim and the resulting lack of accessibility of most rural areas as bridges were damaged or destroyed. The team nonetheless managed to collect most of the data required for the proper implementation of the project. Maps are now being produced for PHF / PHM (their local partner). Additionally, we are pleased to have been able to raise awareness among local stakeholders such as the NGO Care International and the head of the topographic department of the Vatomandry district. Lastly, we managed to obtain local administrative information (such as administrative boundaries) which will be integrated into OSM. This mission was a rich human and technical experience. It was also one of the first missions organized in full autonomy by CartONG, that is to say without the support of an international NGO in the field. During this mission, we once again noted the considerable lack of data collection tools for NGOs and public authorities operating in the field and of their general ignorance regarding OpenStreetMap and existing open-source cartographic data. In order to remedy this situation, we uploaded the OSMAnd application on the smartphones of as many local actors as possible during the mission. We also extensively shared the toolbox produced in partnership with the Agence des Micro Projets. We now hope to launch the second phase of the project in order to go deeper in the use of the data produced by local actors, both for disaster risk reduction purposes and for the implementation of other development projects. We also intend to continue supporting and collaborating with the Malagasy OSM community in order to provide mapping and information management tools adapted to the needs of field workers. 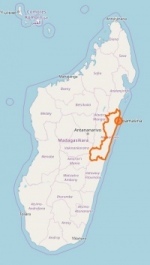 Don’t hesitate to get in touch with CartONG if you know of any organization working in Madagascar which might be interested in maps & open data!